Connecticut tag sales aren't always very good. Sometimes the person holding them uses a Bic ballpoint to write out an impossible-to-see sign that gets stapled on a pole near a busy road. Sometimes things are priced too high or are not priced at all. Sometimes you follow a series of 'huge tag sale' or 'multi-family' tag sale signs all the way out to the middle of nowhere just to find a lot of baby clothes and a Thighmaster. This, as I'm sure you know, is a hospital bedside table. When I bought it at a Mystic, Connecticut tag sale for $5 it had a different top and some stains on the metal legs (I wiped them off with disinfectant trying not to think what they were). It telescopes to different heights and has been useful moving around the shop. But the top is from a leftover part of an art table I made for my wife, and I'd like to keep it looking nice since the hospital table sometimes gets called into service upstairs. I also wanted to pursue ways to make the shop easier to clean to begin with, especially when I clean bike chains. Since my technique of soaking a chain in degreaser is only done in extreme circumstances, most of the time I use a bike stand and a series of chain-friendly degreasers and rags to clean a chain. I always end up getting blobs of grease on the shop floor, which, as you can see in the photographs, are interlocking plastic garage floor tiles. I highly recommend them, but when grease gets on the tiles, they can get tracked all over the shop, the basement stairs, the living room rug, and so on. And it takes longer to clean all of that up than it does to clean a bike chain. 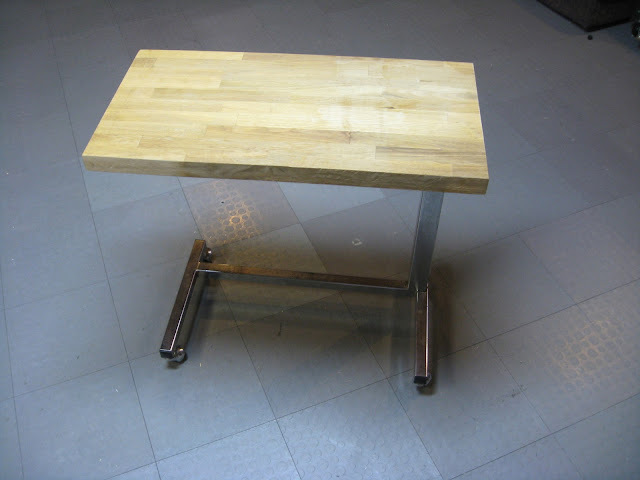 So I hit on the idea of using the hospital table in conjunction with my bike workstand: provided the bike wasn't the recumbent (which takes ten-and-a-half feet of bike chain) I could position the bike so the entire drivetrain was directly over the hospital table to catch the grease. As a bonus, I thought, the surface could be covered with paper. 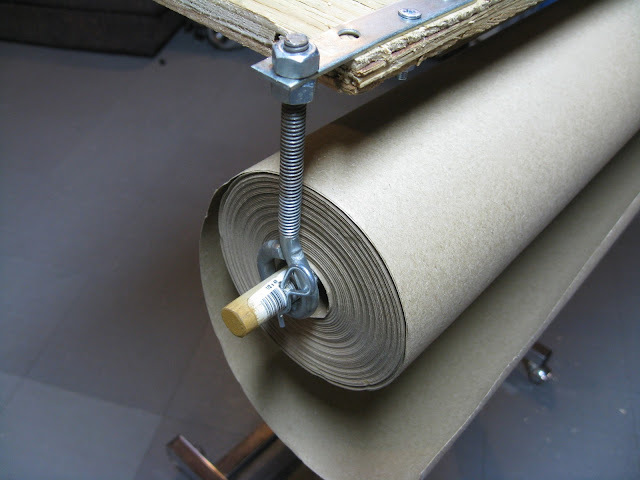 I quickly cut a piece of scrap plywood to size, and then I located a roll of builder's paper and quickly thought of a way to attach it to the plywood. 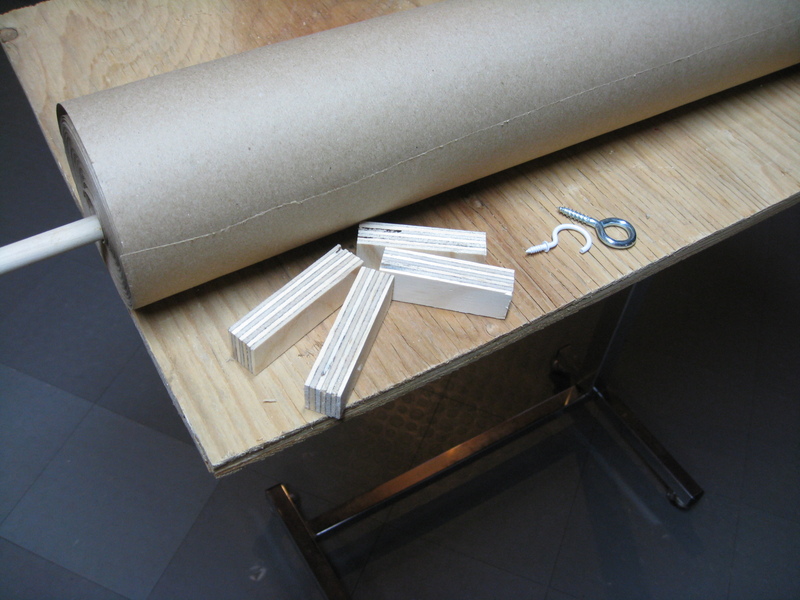 Since I was working too quickly I overlooked a few rather obvious points, the first being I was going to use some wimpy pieces of plywood to make a hanger for the paper roll. 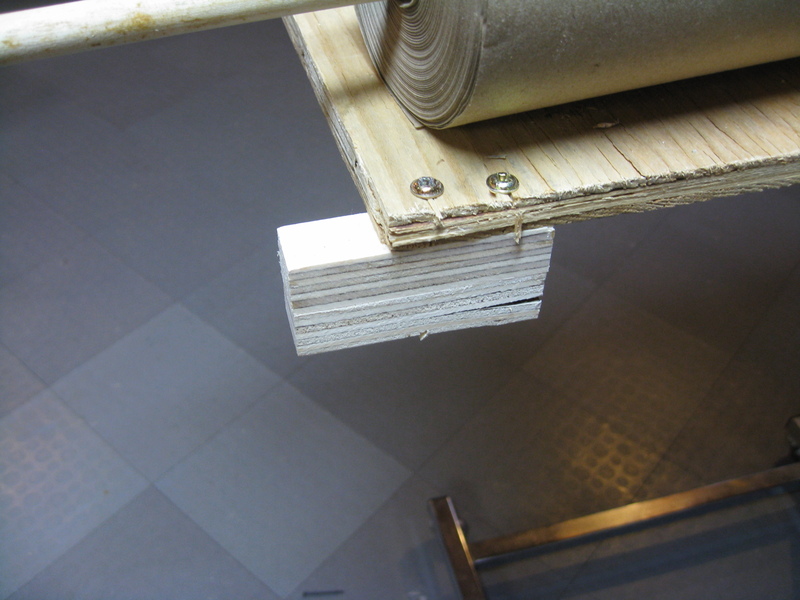 As you can see I split the wood when I was attaching it to the tabletop, and even if I hadn't split the wood I had a much bigger problem: the heavy roll of paper wouldn't fit under where I envisioned it would go. I scrapped the project and tossed the pieces of wood in the trash before turning back to my wall of Stack-On Compartment Storage Racks. The most popular version has 39 drawers, and I have six of those, plus three others from a different brand that add another 70 little plastic drawers, which give me a total of 304 little plastic drawers containing anything from wire ties, luggage locks, Band-Aids, parts from a toy locomotive, and so on. Since the drawers are clear plastic, I can look through and see a lot of new things I have bought and a whole lot of old things I have not thrown away. Little braces. Perfect. 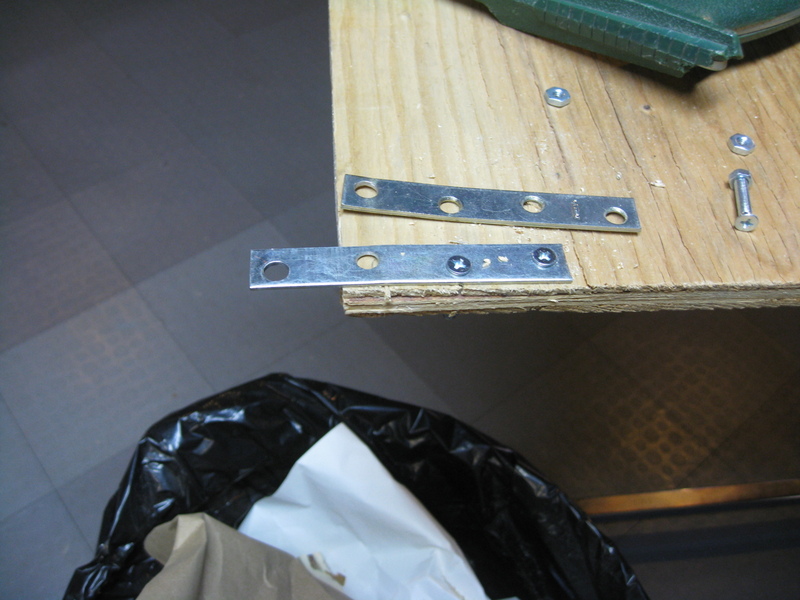 I also used nuts and bolts from another drawer to keep them in place. 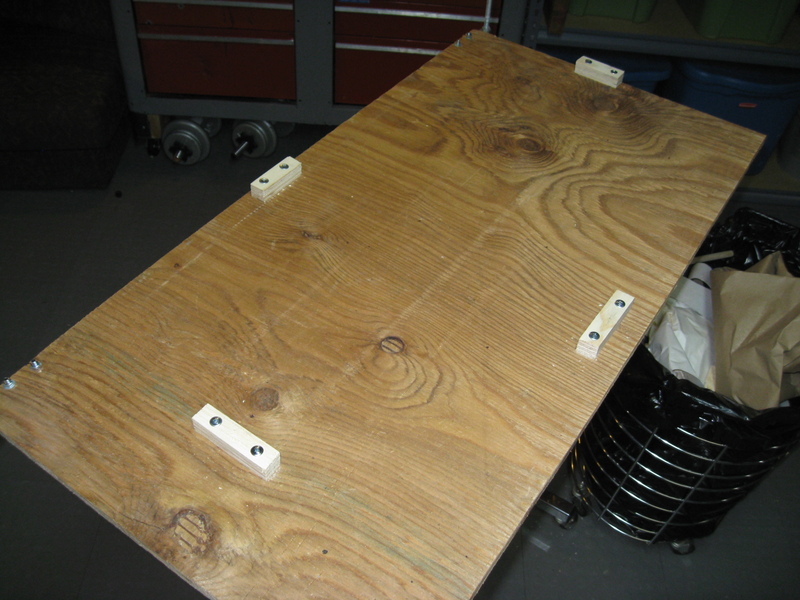 Then I realized I was getting ahead of myself once again: I needed a way to keep the plywood from sliding off the table. I arranged the plywood so it would be mostly centered on the hospital table and used a pencil to mark the edges. Then I reached into the trash bag near my workbench and fished out the four bits of wood I had discarded minutes before. This time, I made pilot holes so they wouldn't split. A wooden dowel was what I had planned to use for the roll of paper, and some carefully placed holes created a place where I could stick a random hitch pin to keep the dowel from coming off the eye bolts. 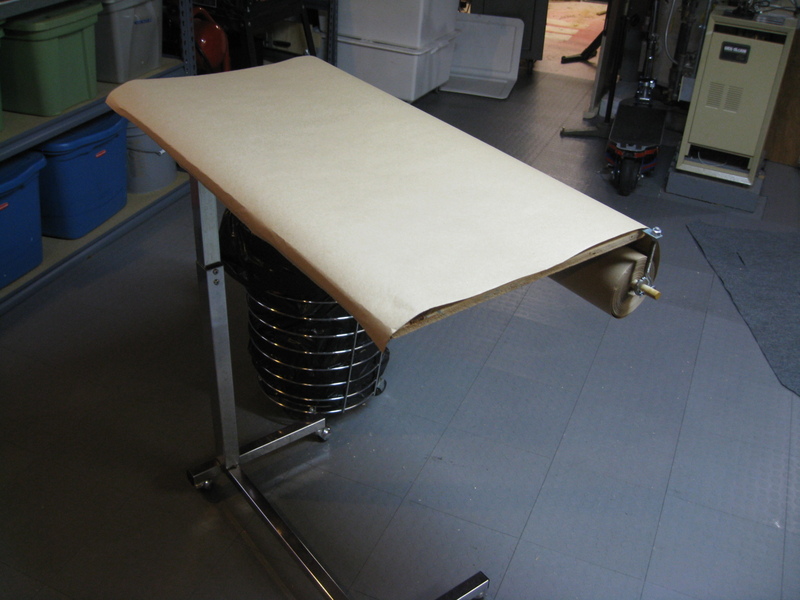 When that was done, I rolled the table away and pulled a sheet of paper over the plywood and took a step back. I decided I had liked what I had done. I have to say, it works great. I let anything and everything drip from a bike chain onto it, and when I'm done I simply use a utility knife to cut the paper, throw it all away, and pull the roll again so I'm ready for the next project. The next time I have a lot of little kids over at the house, I may use it upstairs so they can have a perpetual roll of paper for coloring and drawing. It's Sunday morning. It's not a bad day to cruise tag sales and try to find a hospital table, but if you only find ugly suitcases, VHS tapes, and Big Mouth Billy Bass don't get too discouraged.